Ma Xiaochun (Simplified: 马晓春; Traditional: 馬暁春; Hanyu Pinyin: Mǎ Xiǎochūn, b. August 26, 1964 in Zhejiang, China) is a Chinese professional 9-dan, author, and head coach of the Chinese National Team?. 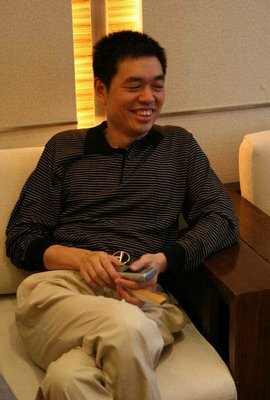 He is best known for his title victories throughout the 1990s, dominance of the Chinese Mingren title, first Chinese player to win an international title, and light, flexible play style. Ma began playing go at the age of nine, and half a year later placed third at a local youth tournament. In 1982 (when he was 18), he was awarded an amateur 7-dan rank. In early 1983, he won the 5th World Amateur Go Championship and was promoted to professional 7-dan status. By the end of the year he had been promoted to 9-dan status through a series of rank promotion tournaments. He became a full-time professional in 1985. During 1985-88 he won several titles, including the Tianyuan, National Go Individual and New Sports Cup. Ma has been noted for his light, airy, elegant and dodging style and opening play. In his early years, this style would clash strongly with that of Liu Xiaoguang in several important tournament matches. Liu played a fierce, combative style opposite to Ma's. Further down the road, Ma's airy style of play would continue to give attacking players a difficult time. 1995-05-24 Nie Weiping 6th Tong Yang Securities Cup Final Masterplay: The Playing Style of Seven Top Pros? 1995-08-05 Kobayashi Koichi 8th Fujitsu Cup Final Masterplay: The Playing Style of Seven Top Pros? A story at GoBase regarding Ma Xiaochun. Chinese language website of Ma Xiaochun. Ma Xiaochun is profiled in the first chapter of The World of Chinese Go, throughout the book Beauty and the Beast, and in Master Play: The Playing Style of Seven Top Pros. The World of Chinese Go p. 1. Beauty and the Beast pp. 48-52, 92-100.